Working with a therapy team that knows their equipment is key to post surgery recovery. For most joint replacement surgeries a short stay in a rehabilitation facility is the best way to transition from hospital to home. 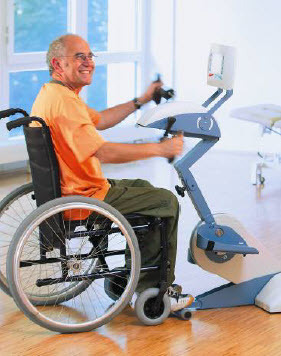 The Lincolnshire Healthcare and Rehabilitation team has selected their therapy equipment with optimal success in mind. Each piece of equipment is specially designed to enhance recovery for selected types of surgeries and/or injuries. Some equipment is especially designed to help the client regain their weight bearing stamina. Other equipment might target strength building in areas of the body that were not injured in order to support the injured area for optimal healing. Of course, proper physical rehabilitation depends on more than physical equipment. The right mental equipment is just as valuable when a patient is striving to return to their daily routine. Choosing a short term rehabilitation facility that understands this important balance of physical equipment and mental equipment will give you the best results and quickest returns. They gave me back my quality of living! The Lincolnshire Therapy Team gave me back my quality of living and my ability to take care of myself when I went home.Thank you so much to your entire team. God Bless! I would recommend them because of their knowledge and skills. My grandma has been staying here for a few months now and I can tell she is very happy. The facility is very nice and I can tell the staff really takes care of her. My Dad was in the Assisted Living area, and I am so very impressed at the lovely accommodations, the cleanliness, and the caring attitude of all the workers. It is truly a home away from home, and perhaps more, as the attention there is so sincere and dedicated – couldn’t ask for more. I currently have a family member who resides here. I have visited them a few times and was very impressed with the staff, the quality of care, and the overall facility. I no longer worry about my family here. I know they’re in good hands and that they will be taken care of!